This week I cover for the third and final time - code review. The direction of this weeks blog comes from our very own coder supreme Sebastian Kreft who pointed me in the direction of a case study done on NASA best practices used to develop the code that landed the Curiosity Rover on Mars. The study is an interesting read, mainly due to getting an insight into the extreme level of quality demanded of NASA code, and yes, you guessed it - peer code review plays a big role in maintaining these high standards. 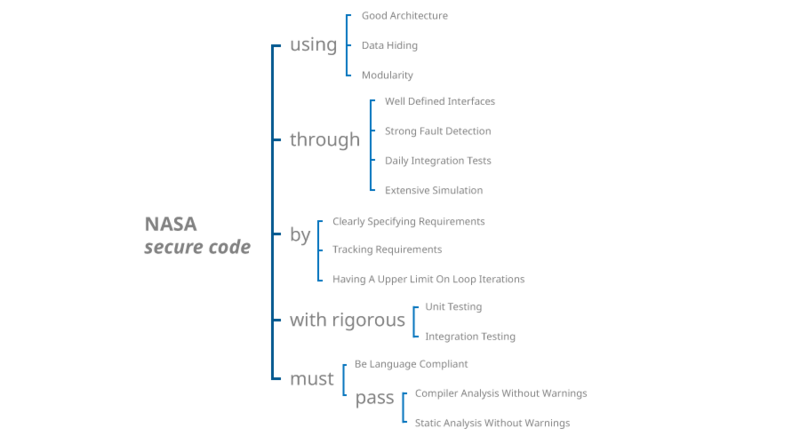 But before I get into that I am going to share with you a mixture of coding philosophy and pragmatic use of tools that drives development processes at NASA. Despite making major advances in human knowledge, strapping 500 tonnes of explosives to a capsule, and blasting it off the planet, NASA doesn't take risks. The coding philosophy revolves around reducing risk in every conceivable way possible, and defensively coding to reduce the amount of potential anomalies introduced into any system. Ensuring software behaves in a predictable manner despite unexpected inputs or user actions. One of the main methods NASA uses to make software behave in a predictable manner is to use code assertions once every 10 lines. This list of risk reduction methods clearly makes for a slow and steady code development cycle as opposed to the quick and dirty ideals often espoused in the consumer focussed development world. But what is interesting is the use of the agile development methodology with daily builds, integrations testing, and extensive peer code review. While reducing risk is one focus of making code absolutely dependable, another angle is to ensure coding standards across development teams. To speed up the process of checking code and reducing the need for developers to carry out repetitive tasks NASA use a number of tools for automated testing. The two most important being Scrub and Spin. Scrub is a static code analysis tool interface that sits on top of different static code analysis tools and unifies their test results so that developers can gather as many static code checks as possible in a unified manner and track any issues that need to be addressed. NASA use Scrub to integrate static analysis products from Coverity, Grammatech, Semmle, and Uno. In addition to static code analysis, module checking is a major focus of the software development phase, especially testing for concurrency issues. To do this, NASA use Spin for the formal verification of multi-threaded software applications to identify unsuspected software defects. Spin targets distributed software systems by using asynchronous threads of execution which aims to expose system executions that violate user defined requirements. This places high levels of stress on assertions and ensures that they behave as expected in all scenarios. One other advantage of Spin is for exposing deadlock scenarios. Once all these tools have added their input into the development cycle the engineers have to go and address any of the issues found by those in addition to programming new features and peer reviewing each others efforts. Luckily, statistics are also kept on the peer code review process and the level of agreement and discussion that takes place. Code review works effectively at removing bugs and improving quality. Without a peer review process it can be difficult to address problems in a codebase but peer review brings collaboration to the fore and when an error is found before it’s committed, everyone can breathe a sigh of relief that it was discovered before it caused a real problem. Peer-reviewed code might take a little more time to develop, but it contains fewer mistakes, requires less time testing, and has a strong, more diverse team supporting it.